Domestic abuse is any type of controlling, bullying, threatening or violent behaviour between people in a relationship. But it isn’t just physical violence – domestic abuse includes emotional, physical, sexual, financial or psychological abuse. Domestic abuse occurs across society, regardless of age, gender, race, sexuality, wealth, and geography. 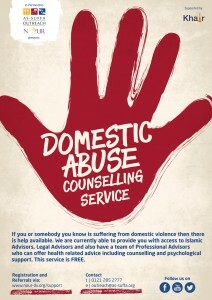 If you or somebody you know is suffering from domestic violence then there is help available. We are currently able to provide you with access to Islamic Advisors, Legal Advisors and also have a team of Professional Advisors who can offer health related advice including counselling and psychological support. This is a FREE service.